Formal recognition of our Anniversary. 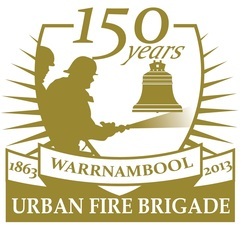 Warrnambool Fire Brigade’s 150th Anniversary celebrations continued in May 2013 with an Anniversary Dinner held in the Matilda Room at the Warrnambool Racecourse. and Senior Urban State Fire Brigade Championships. Fire Services Commissioner Craig Lapsley, Chief Officer Euan Ferguson, Warrnambool City Council Mayor Michael Neoh, VFBV President Hans Van Hamond and MLC for Western Victoria David O’Brien. Ex Brigade Station Officer Rod Silver travelled from Queensland to be at the event. Ex Volunteers Matthew Charles also came down from Queensland, and Andrew Maslen came from Western Australia, combining the dinner with a visit to his family. Also attending was ex-CFA Deputy Chief Officer Keith Johnson who was a Volunteer with the Warrnambool Brigade. history of the Brigade, highlighting facts such as Ned Kelly being 9 years old when the Brigade was formed. Another highlight was the launch of a book about aspects of the Brigade. The book was written by local writer Avis Quarrell, and while not being a specific history book, it does outline the beginnings of the Brigade, and features many aspects of the Brigade’s past. The book is for sale locally at Collins Booksellers in Liebig Street or at Flagstaff Hill for $15.